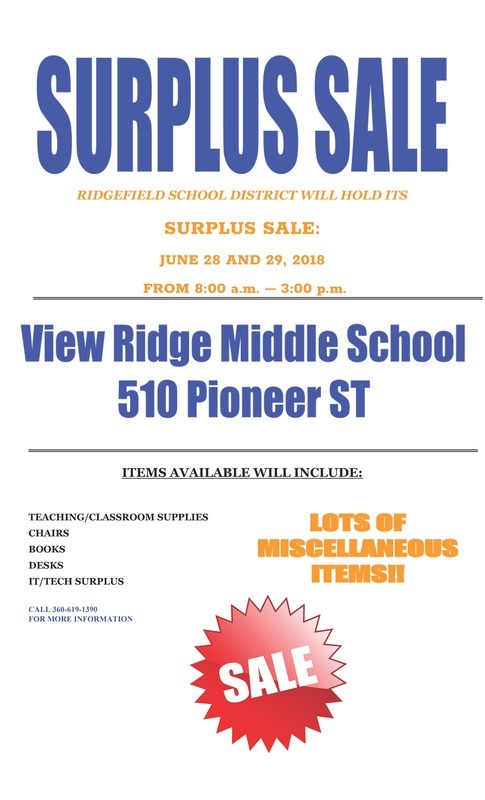 Ridgefield School District will hold a Surplus Sale on Thursday and Friday, June 28 and 29 from 8:00 am - 3:00 pm at View Ridge Middle School, 510 Pioneer Street in downtown Ridgefield. Items for sale include bookshelves, carts, desks, file cabinets, shelving, books, televisions, VCR's, DVD players, video recorders, computers, and assorted office and classroom furniture. For more information, contact the Ridgefield School District Maintenance Office at 360-619-1390.